With greenery and poised taupe labeled as Pantone and Sherwin Williams’ colors of the year, it’s no surprise we’re seeing these two show up everywhere now! 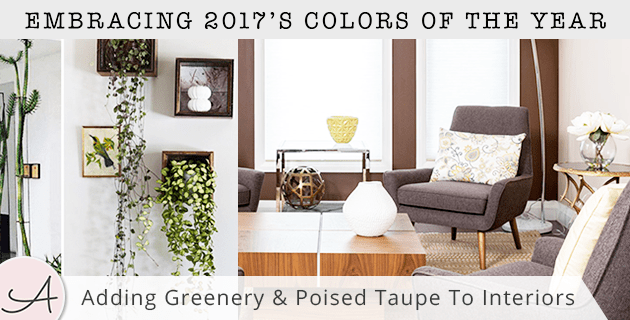 The vibrance of greenery and the sultry color of poised taupe give both color lovers and neutral Nancy’s (hey, that’s not a bad thing!) something new and exciting to work with this year. Both these colors look fabulous throughout an interior, adding liveliness and tranquility. So, if you’re as excited as I am about these two trending hues, check out some of my favorite ways to use them in a design. Greenery, a color that brings an uplifting feel to a space, has been named as Pantone’s COTY. The naturally vibrant tone resonates with us particularly hard this new year, as we prepare for new beginnings as well as reassurance that positivity will overcome negative social, cultural, and political challenges. 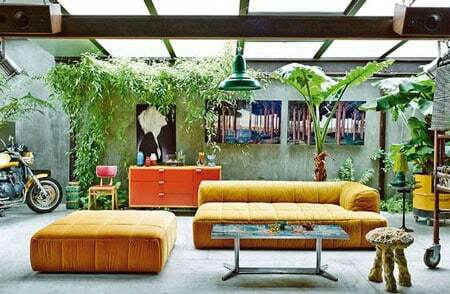 Here’s how to add cheerful greenery to your own interiors! I absolutely love the integration of greenery into this bar design. 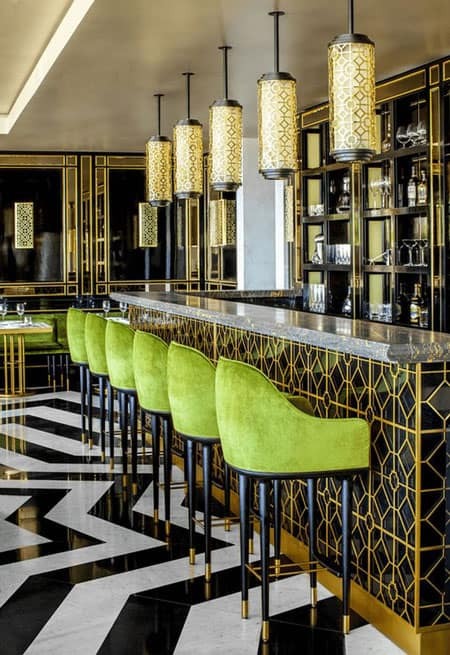 While still keeping the glamorous gold and black color palette, the pops of green work to enhance and complement the timeless look. Plus, the choice of velvet creates a polished interior that screams class with a bit of edge. Add this look to your home through velvet greenery textiles using throw pillows, ottomans, or reupholstering a sofa or sofa chair! Velvet is one of my favorite ways to add in a bright color, as the plush fabric often works to soften the hue while still maintaining its "pop." Make a statement through your artwork! Betty Wasserman kept her design sleek and simple, adding in the right amount of greenery through an art piece while also creating a splash of liveliness to the organic elements of this dining room. Using artwork and lighting to make a statement allows for you to keep your design style as is - without extra textiles or decor that may clutter your home. If you want to add greenery to your home in this way, Lumar Interiors has some great artwork showcasing beautiful shades of greenery. This beautiful bathroom design might not necessarily need the extra pop of greenery, but it sure did create a magnificent and magical sight. A color as bold as greenery usually needs to be paired carefully, however, as you can see, the beautiful color of nature perfectly blends in with a varying color palette while still standing on its own. Mosaic tiling, although a huge trend in interior design right now, does take more time and effort to integrate. However, if you want to add a touch of green mosaic to your bathroom or kitchen, it will add an aesthetic value that furnishings and decor can’t! Bring the outdoors in - literally! Whether you want to showcase a few houseplants or completely make nature’s coloring the focus of your interior design, adding touches of the real stuff is the ultimate way to add greenery to your home! Make sure to seek out plants that will thrive in your home, most likely in a room that receives adequate sunlight. Take care of your plants and their green vibe will emanate unique beauty throughout your home! Another color of nature, poised taupe offers warmth and tranquility rather than an energetic liveliness. Many designers are loving the Sherwin Williams 2017 COTY as the combination of brown and grey offers a timeless hue that works well for all designs - from modern to rustic - making it one of the most versatile color choices right now. Showing off a lot of browns in your home, either through wooden casegoods, hardwood floors, or accent walls? Poised taupe will give a complementary contrast to your organic color palette, creating an inviting and sophisticated interior. Nicola Interiors balanced the light woods and chocolate wall color with poised taupe textiles - creating a focal point which merged together all of the other design elements. Add soft poised taupe textiles to your home through throw pillows, area rugs, window treatments, and upholstered furnishings. With such a close resemblance to grey, adding these textiles to your current design will undoubtedly establish a refined look. 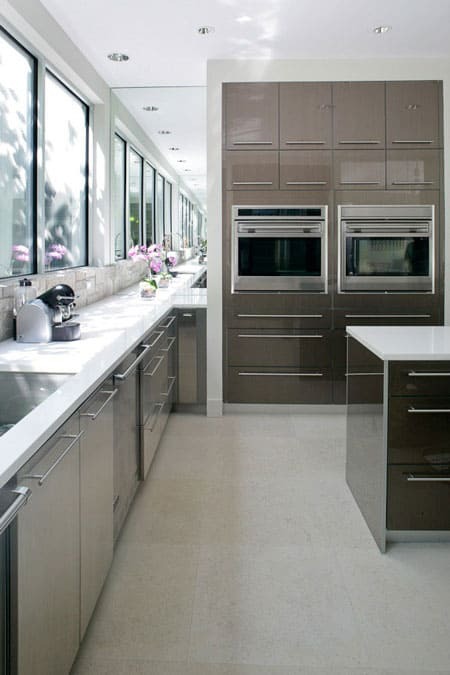 I love Betty Wasserman’s use of poised taupe in this modern kitchen. Sleek cabinetry with a gloss finish gives this “color of the year” a trendy and updated look, making it stand out on its own against the minimalist setting of the design. Again, with its hint of grey, adding this color to your kitchen will seamlessly integrate with any stainless steel appliances while also warming up the overall look, which is sometimes a missing attribute in an ultra modern design. If you’re not looking to replace your kitchen cabinetry, think about adding poised taupe through your finishes and hardware, including light fixtures, cabinet knobs, or bar stools. Even the most formal of rooms can benefit from a beautiful poised taupe accent! 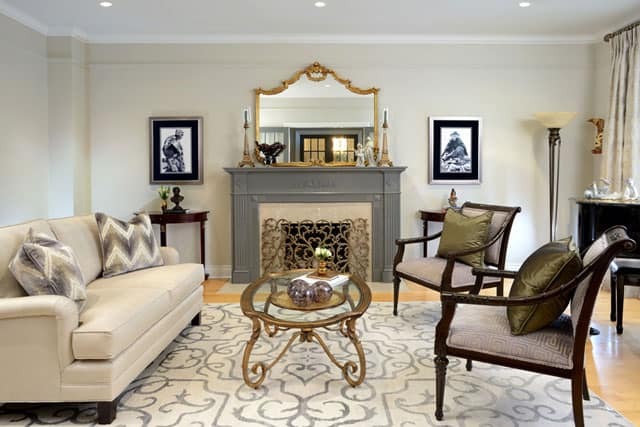 Lumar Interiors creates a unique feature piece through the fireplace mantel, painting it in a glamorous poised taupe and adding smaller complementary pieces through the throw pillows and area rug. The darker woods and golden finishes on the mirror and coffee table have kept their luxurious demeanor, but the overall design is given more movement with the addition of a warm, contemporary poised taupe. Painting your smaller architectural elements, be it a fireplace, doorway, or staircase banister, will offer your home an earthy touch. When adding accents to an interior, it’s about creating complementary layers and a subtle but powerful wow-factor, so don’t be shy to get out your paintbrush as there’s little room to go wrong with this down to earth hue! 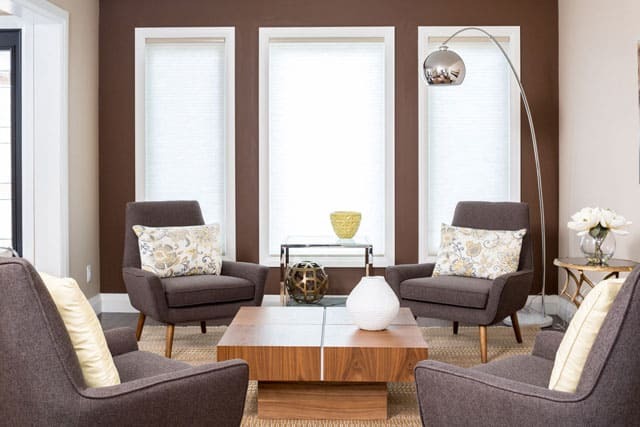 Although a muted and neutral color, don’t underestimate the power of a poised taupe wall! A stunning choice to merge with your other neutrals, poised taupe offers a modern spin to timeless monochromatic designs. As the perfect background to soft earthtones, crisp whites, and yes, even greenery, your furnishings and walls will equally stand out, showcasing a beautiful interior design from all angles. I'm sure this color will look amazing on your walls, but if you want to test the waters before jumping in, try it out as an accent wall, first. This color blends wonderfully with basically all colors, neutrals, prints, and patterns, so don’t shy away from it - give it a try and i'm sure you will love the sophisticated brown-grey effect it has on your home! Hope you all enjoy adding these two colors to your interiors this year! Let me know your favorite ways to add greenery & poised taupe in the comment section!